built by Masdar, a subsidiary of Mubadala Development Company, with the majority of seed capital provided by the government of Abu Dhabi. It is Designed by the British architectural firm Foster and Partners and engineering and environmental consultancy Mott MacDonald , the city relies entirely on solar energy and other renewable energy sources, with a zero waste ecology. It initially aimed to be a sustainable zero-carbon car free city. Masdar City is being constructed 17 kilometres (11 mi) east-south-east of the city of Abu Dhabi, beside Abu Dhabi International Airport. 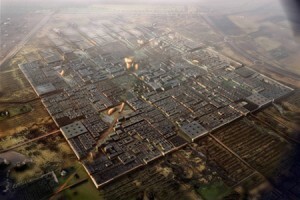 Masdar City will host the headquarters of the International Renewable Energy Agency (IRENA). The city is designed to be a hub for cleantech companies. 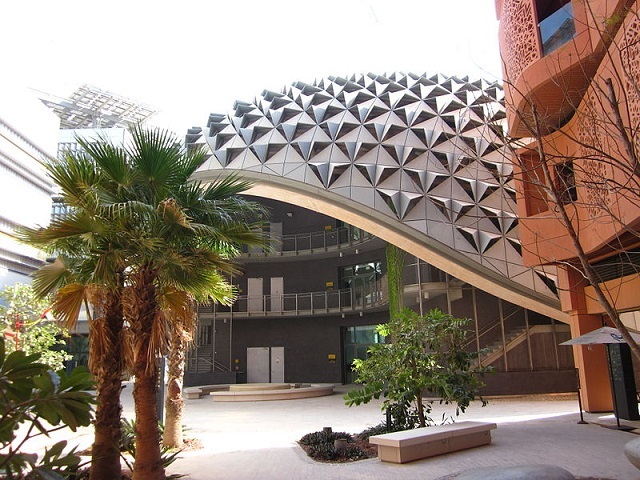 Its first tenant is the Masdar Institute of Science and Technology, which has been operating in the city since it moved into its campus in September 2010. The city as a whole was originally intended to be completed by 2016 but due to the impact of the global financial crisis, the date has now been pushed back to between 2020 and 2025. Due to the limitations found during the initial implementation, the city is now aiming to be low carbon. The project was projected to cost US$22 billion and take some eight years to build, with the first phase scheduled to be completed and habitable in 2009. 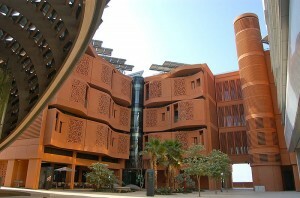 Construction began on Masdar City in 2008 and the first six buildings of the city were completed and occupied in October 2010. Phase 1 of the city, the initial 1,000,000 square meters (0.39 sq mi), will be completed in 2015. Final completion is scheduled to occur between 2020 and 2025. The estimated cost of the city has also declined, to between US$18.7 and 19.8 billion. The city is planned to cover 6 square kilometers (2.3 sq mi) and will be home to 45,000 to 50,000 people and 1,500 businesses, primarily commercial and manufacturing facilities specialising in environmentally friendly products, and more than 60,000 workers are expected to commute to the city daily. with existing road and railways connecting to other locations outside the city. The absence of motor vehicles coupled with Masdar’s perimeter wall, designed to keep out the hot desert winds, allows for narrow and shaded streets that help funnel cooler breezes across the city. In October 2010 it was announced the PRT would not expand beyond the pilot scheme due the cost of creating the undercroft to segregate the system from pedestrian traffic. Subsequently, a test fleet of 10 Mitsubishi i-MiEV electric cars was deployed in 2011 as part of a one-year pilot to test a point-to-point transportation solution for the city as a complement to the PRT and the freight rapid transit (FRT), both of which consist of automated electric-powered vehicles. Under the revised concept, public transport within the city will rely on methods other than the PRTs. 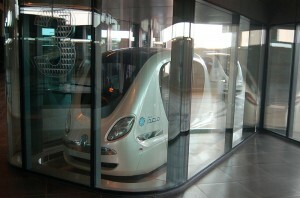 Masdar will instead use a mix of electric vehicles and other clean-energy vehicles for mass transit inside the city. The majority of private vehicles will be restricted to parking lots along the city’s perimeter. Abu Dhabi’s existing light rail and metro line will connect Masdar City’s centre with the greater metropolitan area. 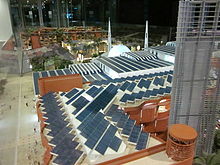 has been behind the engineering plans of Masdar City and is at the center of research and development activities. The institute, developed in cooperation with the Massachusetts Institute of Technology, uses 70% less electricity and potable water than normal buildings of similar size and is fitted with a metering system that constantly observes power consumption. built by the German firm Conergy, which will supply power for all other construction activity. This will later be followed by a larger facility, and additional solar panels will be placed on rooftops to provide supplemental solar energy totalling 130 megawatts. Besides photovoltaics, concentrated solar power (CSP) plants are also being explored. For example, so-called “beam down” CSP plants (be sure to watch the video clip) have been constructed to test the viability of the concept for use in the city. Wind farms will be established outside the city’s perimeter capable of producing up to 20 megawatts, and the city intends to utilize geothermal energy as well. In addition, Masdar plans to host the world’s largest hydrogen power plant. Water management has been planned in an environmentally sound manner as well. A solar-powered desalination plant will be used to provide the city’s water needs, which is stated to be 60 percent lower than similarly sized communities. Approximately 80 percent of the water used will be recycled and waste water will be reused “as many times as possible,” with this greywater being used for crop irrigation and other purposes. The exterior wood used throughout the city is palmwood, a sustainable hardwood-substitute developed by Pacific Green using plantation coconut palms that no longer bear fruit. Palmwood features include the entrance gates, screens and doors. Let’s hope Masdar will not just be an expensive experiment but will truly become the prototype for all cities for our sustainable future. This entry was posted on Sunday, November 3rd, 2013 at 2:45 AM	and is filed under Educational. You can follow any responses to this entry through the RSS 2.0 feed. You can leave a response, or trackback from your own site.